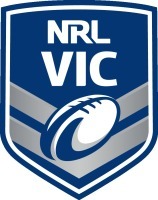 The 2018 NRL Victoria season provided many highlights within the domestic competition and to a higher level in the representative programs. The recipients of each award at the Awards Night were determined by NRL Victoria’s Awards Panel which was composed of Brent Silva [NRL Victoria General Manager], Len Mason [NRL Victoria Life Member] and Andrew Blowers [Melbourne Storm Welfare Support]. The weekend’s Awards Night gave NRL Victoria and all clubs the chance to celebrate the contributions made by all volunteers and referees to our great game. The referees’ contribution to our game is invaluable and this gives all referees the chance to be rewarded for their efforts throughout the year. While the players play a pivotal role for the success of Rugby League in Victoria, volunteers are just as important for the continual success. Without the aid of helping on match days and organising teams, the success of 2018 would not have been possible. Sharyn is the president of the North West Wolves for all 11 teams in the club, affectionately known as the “Wolf Pack”. With many nominations submission for Sharyn sharing that she is instrumental in all the kids at her club having an awesome time playing Rugby League and without her there would not be a club. Her unfailingly happy cheerful and welcoming personality and unwavering commitment to the club over the last few years has been credited to the success both on and off the field. She is dependably the go to person at the club and is constantly organising, welcoming, managing and recruiting for the club, rarely seen without a smile on her face. She has even been spotted moonlighting as a cheerleader on game days! Sharyn has always has implemented an open-door policy and is trusted to make all members of club, new and old, feel welcomed which has been the foundation for the dynamic culture that radiates throughout the club today. This award is an acknowledgement of Sharyn, and her family, for her outstanding commitment to the club over the last few years, a well-deserved nomination for volunteer of the year. Sal has been volunteering at the Wodonga Storm Rugby League Club since 2014, dedicating as many as 25 hours per week to junior rugby league and league tag. Referees junior and senior matches. On top of all this she is a mother of eight children – and another one on the way! Sal is always willing to welcome more into the wider Wodonga Storm family and rugby league in the Murray Cup region. Through her positivity and dedication, she has had a huge impact on a number of young players at the club. Seen as the lifeblood of the club, Sal and her husband are incredibly involved in the club and their impact has not gone unnoticed. Sal and Ryan were recognised as the first Wodonga Council Volunteer Team of the Year. Her work is even being recognised in the broader community. Henry is the coach of the U15s Northern Thunder team, and has been for the last 5 years. It is the success of the team since being under his guidance that has earned Henry a nomination for coach of the year. The Northern Thunder under 15s have appeared in five grand final appearances, for a record of 4 premierships, including this year’s 22-20 nail biting victory over the Sunshine Cowboys. Another testament to his coaching ability is the selection of several players under his guidance to go on to higher representative honours. A number of club members believe that it is Henry’s expansive Rugby League knowledge, having previously played himself that is credited to their success. Henry is also regularly seen willingly lending this knowledge to other coaching staff of the club. Off the field, Henry has been described as more than just a coach, but also a father figure, and is always striving to develop more than just the Rugby League skills of his players. Northern Thunder and NRL Victoria would like to thank Henry, and his family, for his contribution and believe he is a more than deserving winner for Coach of the Year. Bryan’s passion for the game emanates both on and off the field. His warm nature makes him extremely approachable, which has been an asset in improving the skills and knowledge of participants of all ages of the game - whether it be officials or players alike. He has been instrumental in coaching and mentoring younger referees, and is always willing to lend his time, extensive knowledge and experience which has been fundamental in improving the overall quality of officiating in Victoria. Bryan will always take the time to explain the rules to players before, during and after matches, which is invaluable to the development of the players he comes into contact with. NRL Victoria would sincerely like to thank you on your immeasurable contribution to the game of Rugby League. Tasia played an integral role in the VIC Women’s success at the Combined Affiliated States Championships in Sydney in March where the team won all 3 games. Playing at Lock, Sia’s defence rocked the Championships while her running game saw her make many line breaks. Sia was also selected in the CAS team to compete at the inaugural Women’s National Championships. In 2018, Harry Sio was instrumental to the success of the U15’s team who won all of their 9 games throughout the year on their way to winning the John Allen Trophy at the National Championships in Mackay and the CRL Cup in Dubbo and Charlestown. A hard-running back rower, Harry made countless line breaks and scored some impressive long range tries using both his size and speed from his tally of 9 in 9 games. Harry was also the youngest member of the Melbourne Storm Victorian talent squad which took part in monthly training sessions throughout 2018. Neff has volunteered within the NRL Victoria/Melbourne Storm representative scene for more than a decade. With the evolution of the Victoria Thunderbolts and a full season U20’s program in 2018, his work ethic and selfless attitude provided great support to the coaching staff and player’s. Neff is the kind of person who when asked, will do whatever task is required no questions asked. The on-field success that the U20’s Thunderbolts had this season is a reflection on this man and his behind the scenes work he put in. The NRL Victoria Women’s First Grade competition took a step up in quality in 2018, and votes were spread out well amongst the competition. Teuila shot to the top of the Leaderboard after earning 3 votes in Round 11. She was unable to be chased down over the final rounds of the competition and came away crowned the 2018 Player of the Year. Alti’s season was a story of two halves. He had not received any votes prior to Round 9, but with 4 player of the match performances in the second half of the season saw him rocket to the top of the leaderboard. 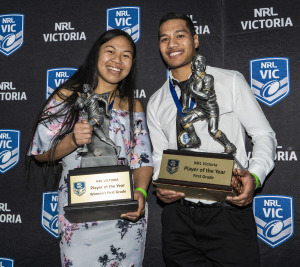 Alti managed to hold off the duo of Shae Ah Fook and Damien Paila to win the 2018 Player of the Year.